We offer a variety of panel systems that range from table top panel displays to slat wall panel systems. We carry light duty panels systems that are light and easy to assemble. All of our panel systems are from US suppliers and are all shipping locally. Turnaround time for production is usually 1-5 business days. 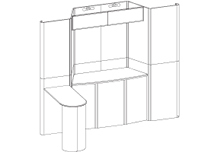 We also carry a full line of pop up displays that will work in place of a panel system. Why Choose a Panel System? Floor standing panel systems are great portable display options. They are available with graphics or Velcro receptive fabric panels making them very versatile for multiple trade show uses. Table top panel displays set up more quickly than any other table top display. They literally fold out and are ready to go! They are available with graphic panels or Velcro receptive fabric! Trade show panel displays are some of the most portable display options available. They are very versatile and can be used in multiple events and conventions. Trade show booths are very good marketing tools that can help to promote your company at trade shows and events. 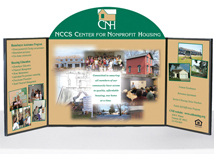 Panel systems offer the versatility of a pin up booth with the option of full coverage graphics. Panel systems can be configured to accommodate alcove and peninsula counters for added versatility. These counters are not available on most display systems and usually require the purchase of a freestanding counter. The Hero panel system offer many options that other displays lack. The Hero and Voyager system both come from Orbus Company. We can ship these displays out of either IL or NV bringing down shipping time and cost. Both systems are quality displays that are shipped and quality controlled in the US. The Hero system has a double sided frame so one side can be covered in graphics while the other side can be used to hang photos or products. The Voyager system is a premium quality version of the standard briefcase style road display. The hard plastic shell protects the display while on the road. The panels are Velcro receptive and can accommodate graphics. An optional header is available to add height and dimension to the system.